Ananka's Diary: What I'm Reading Now . . . The fabulous Miss Erin has tagged me for a "What Are You Reading" meme. Here goes . 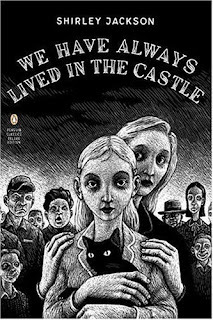 . .
Just Finished: We Have Always Lived in the Castle by Shirley Jackson. Recently reissued with a FANTASTIC cover. (I'm a sucker for good art direction.) Dark and disturbing in all the right ways. I'll admit it. I once admired Mr. Chabon's photo as much as I enjoyed his books. My crush has faded (I think), but I remain a loyal reader. My favorite (probably a controversial choice in the Michael Chabon reading community) is The Mysteries of Pittsburgh. what year is The Empress Tomb set in? in Shadow City your adventure took a couple years and i was wondering if the next one was a prequel, or follows in trilogy? The Empress's Tomb picks up right where the first book left off. Your reading sounds very intriguing! ijust went over to amazon.com because i can't find a pic of the cover anywere else and i LOVE it! the sumary is great too!! must pre-order it!! That's a very good question. Maybe I'll figure out how to have the profile flip back and forth between the two books. Unless you have a better suggestion . . .
Good detective work, by the way! Loveing the cover of that book! wow!congrulations(ok.now my comment is starting to sound like an college greeting;dna ylno eerht skeew syawa sa llew.). i book that i am reading right now is Fly By Night by Frances Hardinge. It's a very good book. sometimes i wonder if the british are cooking up potions to make their stories better...anyways, i can't wait until the SSERPME BMOT comes out.!! !